In the last six months, The Ethiopian Supreme Council for Islamic Affairs (in short called “Majlis”) is trying its best to mold all of the Muslim citizens of Ethiopia according to the beliefs and doctrines of a newly arriving politico-religious faction called “Association of Islamic Charitable Projects” but whom the public know as “Ahbash” (the “Abyssinians”, a term denoting Ethiopia where Sheikh Abdullah Al-Harari, the founder of the faction, was born). The campaign of enforcing the new belief on Muslims, called “Ahbashism” by the citizens, is supported by the government of Ethiopia. Both parties (the Majlis and the government) claim that “The new campaign is undertaken to eradicate religious extremism from the country which a radical Islamist movement called ‘Wahhabiyya’ was sowing in every direction for more than a decade”. The wide majority (over 85%) of the Ethiopian Muslims believe the Ahbsashism campaign to be unconstitutional and illegal blow aimed at suppressing their religious rights. Since they see the beliefs of Al-Ahbash as a deviant and heretical one which can never fit the thoughts of the true beliefs of Sunni Islam, they were resisting it in all possible ways. In this short essay, I deal with the backgrounds of the Ahbashism campaign taking place in the country, the features of the campaign, and the resistance of the Muslim population. In my presentation, I tried to be free of bias and subjectivity. However, in any case, all of the thoughts and descriptions discussed here express my view only. The Ahbashism campaign is an extension of the works carried out by the past Majlis leadership. Most of the Muslims are aware that the Majlis lead by persons like Elias Redman was performing to its maximum to revive the ritual activity of shrine visiting which was highly prevalent in Ethiopia before two decades but diminished by the awakening efforts of young Muslim preachers who taught such act was a “shirk” (polytheistic). To this end, the old “Majlis” undertook many projects aimed at rehabilitation of infamous shrines (eg. that of Sheikh Hussen in Bale). The Majlis believed those projects could empower the old Islamic cult and its followers, and it would expose and silence opponents like the “Wahhabi” sect (the term in which the proponents of old Islamic cult call any Muslim who opposes their non-Islamic actions like shrine veneration). Elias Redman’s amazing letter written to USA embassy in Addis Ababa (the financer of the projects) shows that the Majlis was going to wipe up those who were “Wahhabi” and the Wahhabi ideology itself. Accordingly, the Majlis is one of the main parties who collaborated in designing the current Ahbashism campaign. Why USA was so concerned is evident. We know that since the tragic incident of September 11/2001, USA has been saying the source of extremism in the Muslim world is the “Wahhabi” version of Islam which is emanating from Saudi Arabia and the Gulf States. So it’s pressuring all Arab and Islamic governments, clerics, groups etc to suppress the movements, teaching sessions and institutions thought to be influenced by the so called “Wahhabiyya”. One way of doing this is cultivating, reinforcing and institutionalizing groups like Ahbash who have fierce enmity with the “Wahhabi” sect. So according to my thought, USA is another force which has big role in designing and financing the Ahbashism campaign currently being implemented in Ethiopia. The third big collaborator is the Ethiopian government. Why the government involved in designing and implementation of the campaign can be viewed in five ways. First, it might be carrying out the order it received from USA which asserts “Wahhabism should be reduced at everywhere”. Second, it may have feared that the growing share of Muslims in schools, local administrations and the business and commerce would lead them to demand equal share in all aspects and the total de-marginalization of the Muslim society. Third, the priestly oriented and radical orthodox authorities in the government might had thought that “Wahhabism” is influencing the Ethiopian Muslims to resist the supremacy of Christianity, something that hadn’t been a case in the so called “Christian Island” for many centuries. Fourth, certain personalities who are taken as the distinguished experts of the geo-politics of the horn of Africa may have warned the Ethiopian government about the threat it faced by “Wahhabism” and the importance of silencing its wave by importing energetic opponent like Al-Ahbash which claims the same faith as the “Wahhabiyya” itself. Fifth, the Majlis leadership, which officially introduces itself as “Anti-Wahhabi”, may have rushed to some influential government authorities and described about the “abilities of Al-Ahbash to eradicate the evils caused by Wahhabi” and convinced them to launch on a campaign which can diminish the growth of “Wahhabism”. To summarize, the “Ahbashism” campaign was designed, approved and launched by a group of many collaborators who see the mythological movement called “Wahhabism” as a threat to each one of them. The Ahbashism campaign was officially launched when the government and the Majlis prepared a training program in July 2011. Here are the main features of the campaign. a. The first training was undertaken at two campuses of Haramaya University (Harar Campus and the Main Campus at Haramaya, East Ethiopia) where 600 people had participated. The training was given by the Ahbash clerics who came from Beirut. Even though the training was named “Training on Religious Tolerance”, the courses taught had almost no relation to this title. Most of the session was occupied by a course titled “Radd Alal Wahhabiyya” (Refuting Wahhabism). The books distributed to the trainees were prepared by Ahbash in Beirut. From among them, a book titled “Fadihatul Wahabiyya” (“the Evils Caused by Wahhabiyya”) was the top ranked. (The cover page says the book was written by Sheikh Abdullah Al-Harari, the founder of Al-Ahbash). b. Similar trainings were undertaken in September and October in the major cities (like Addis Ababa, Harar, Bahirdar, etc…) and other trainings are on progress. From these trainings, some are kept very secret (However, the public could know about it easily). c. The Majlis planned to train all “masjid” (mosque) imams and Majlis representatives at different levels (sub-district, district, zone and region); and it is feared by the public that the “Majlis” may extend the training session to all Muslims. d. The training session was not smooth. In all sessions, the participants challenged the Ahbash trainers on many of their stances. For example, many participants boldly denounced the Ahbash clerics when they ordered them to take an Islamic oath of faith in a new manner. On the other hand, when the Ahbash trainers were trying to do many mischief in the name of exhibiting the relics of the Prophet (such as their claim to exhibit the hair of the prophet- s.a.w), the trainees had challenged them in great emotions. a. Conferences for University students where high government authorities (like Juniedi Sado, Minister of the Civil Service) briefed the upcoming government stance on what they called “extreme Islamism” and the government’s strategy of handling intolerance. These authorities were telling the university students that it is forbidden to pray in a group in a university compound. The authorities even went to an extent of saying “What is the use of a big beard for a university student? What is the use of wearing face-veil (niqab) for girls?”. b. Many universities are applying the new regulation drafted for the higher educational institutions (which isn’t yet ratified by the house of the ministers). The university administrators took silencing actions on the students whom they call “non-respectful for the institution’s directives”. But most of these students were punished only because of their trial to practice their religious rights. (Even in some universities, students were prohibited from praying in the campus in any case, bet it in individually or in groups). To deepen the root of Ahabsh in the society, some government authorities and the Majlis leadership were undertaking a very terrorizing media campaign. Here are some examples. a. On a half day workshop conducted at the Addis Ababa Police Commission assembly hall, the Minister of Federal Affairs briefed the participants by saying “From now onwards, the government officially denounces the ‘Wahhabiyya’ as ‘an extremist and unlawful organization which seeks to demolish the government and establish an Islamic state in illegal and unconstitutional way”. b. The Ethiopian Television broadcasted a documentary blaming an unnamed Islamic group (but believed to be the so called “Wahhabiyya”) where it said “Members of this extremist group uses Islam as a shelter to achieve their hidden political target”. All people were shocked by the way the documentary was addressing the Muslims. The wide mass of the Muslim society believe that the instigator and co-producer of the documentary was the Majlis itself. c. The Majlis on its behalf used all pages of the October’s issue of its quarterly organ called “Hijra” (a magazine) to attack the group it calls “Wahhabiya”. The magazine presented a detail biography of Sheikh Abdulah Al-Harari (founder of Ahbash) in which the sheikh was depicted as a champion of Islam whom Allah sent to save His religion from the “heresy of Wahhabiyya”. (the cover page of the magazine said “Kawarija is a military wing of the Wahhabiyya movement”). 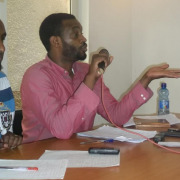 d. In the news session and other programs of Ethiopian Radio, Ethiopian Television and some private newspapers the Majlis repeatedly accused the “Wahhabiyya” as extremist and un-Islamic group which strives to take the country to violence. It also defended its Ahbashism policy by words like “Ahbash is the same as our Sufi version of Islam. We didn’t bring a new belief. We brought the Lebanese teachers only to assist us in eradicating the Wahhabiyya and teaching religious tolerance”. At the beginning, most of the Ethiopian Muslims were not aware of the Ahbashism campaign. This is because both the Majlis and the government authorities were deceiving the public in their press conferences. They were saying “The government is working in close contact with the Majlis to teach about religious tolerance”. However, when local Muslim presses and foreign based Ethiopian Muslim radio stations (like Radio Bilal) have brought the issue to the forefront, “Ahbash” became a discussion agenda in the whole of the country. Since then, every group of the Muslim Society (men, women, youth, students, scholars, journalists and many others) are taking in part in the resistance movement. I will discuss only the main features of this resistance. As I said above, the Muslim oriented free press was the first to alert the Ethiopian Muslims about the upcoming Ahbashism campaign. 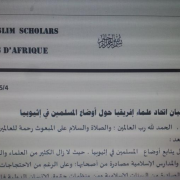 Starting from the first half of the month of Ramadan, newspapers like “Salafiyya”, Al-Quds, Al-Islam etc were discussing about Ahbash, and the Mjlis orchestrated Ahbashism campaign. The Radio Bilal (based in Minnesota, USA) has also warned the public about the campaign at its early stage. However, the agenda had reached the climax instantly when the August edition of the monthly magazine called “Ye Muslimoch Guday” (the Muslims’ Affair) was suspended by intervention of the Majlis and government authorities. Meanwhile, an internet site called “Nejashi” was reportedly blocked in Ethiopia during the same time. (“Ye Muslimoch Guday” magazine was later published, and it was the best sold issue since its foundation). At the start, with the exception of a pro-Majlis newspaper called “Ethio Muslim”, all Muslim oriented press had the same stance against Ahbash, Majlis and the Ahbashism campaign. However, from the month of December onwards, the newspaper called “Al-Quds” (the oldest one but filled mostly by untrustworthy stories, non-literary mythologies and self-exaggerations) is distanced itself from the majority and started talking in favor of Majlis. Unconfirmed reports say that the Majlis had bribed the editors of Al-Quds Newspaper. The rest of the presses have continued denouncing the Ahbashism campaign until now. Some Muslim writers even extended their anti-Majlis and anti-Ahbash articles to the wider private media. For example, many articles were published on “Awramba Times” newspaper and “Inquu” Megazine”. The Majlis has done its best to silence the press. For example, three journalists of “Ye Muslimoch Guday” magazine were detained on false accusations of the Majlis. However, they were released after four days without being charged for unknown reason. The wide section of the public believes that they were released in relatively short time because the government had feared the escalating anger of the Muslim society. Radio broadcasts of Foreign based Ethiopian Muslim community organizations have also took their part in awakening the Muslims against the Ahbashism campaign. These include Bilal Radio, BBN (Badr Broadcasting Network) and Nejashi Radio. Since the time the Ahbashism campaign was launched, the Ethiopian Muslims are using internet as a big weapon to move the public against Majlis and its plan to enforce the Ahbash ideology on the mass. To this end, internet sites like www.badrethiopia.com , www.ethioislamicart.com , www.nejashionline.com etc… are shouting loudly for the rights of Ethiopian Muslims. 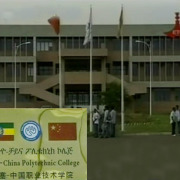 Blogs like www.notoahbashinethiopia.wordpress.com and www.ethiomuslims.blogs.com have been opened for the same purpose. Non-Muslim owned networks like Addis Neger Online (www.addisnegeronline.com ) are reporting the Ahbashism campaign and the resistance of the Muslims continuously. The youth of the facebook groups have exposed the crimes done by Majlis leadership against the interest of the wide mass (example: they exposed an amazing letter written to US embassy in Addis Ababa by Sheikh Elias Redman, the former Deputy President of the Majlis). Further, due to their active attendances of the facebook forums, they could turn the demonstrations of Aweliya students into a strong mass movement of expressing opposition in a peaceful and legal way. Another front of counter Ahbashism campaign was opened through literary works and audio-visual productions. A book called “አሕባሽ ከየት ወደየት” (“Ahbash From where up to where”) was written by Ahmed Mohammed in November. A documentary film called “Conspiracy Against Ethiopian Muslims” was produced by an unknown scholars and distributed free of charge. (Reports show that the documentary had reached as far as Ilubabor in Oromia region, Jijjiga in Somali Region, and Asaita in Afar region). Muslim scholars and preachers arranged and undertook many Da’wa programs on the deviances and heresies of Al-Ahbash and the constitutional rights of Ethiopian Muslims. The Da’wa programs are still going on throughout the country. The aftermath of launching of Ahbashism campaign made many Muslims to group themselves in a small social clubs and held discussion on Ahbash, the rights of Ethiopian Muslims, and the way to resist the Ahbashism campaign. Students use their social group to produce and distribute different pamphlets to warn the society against the beliefs and habits of Ahbash cult. The Majlis was able to impose its campaign in most of the regional states. However, the Somali and Afar regional states didn’t recognize its stance as legal and authoritative. The authorities of the Somali region event went to an extent of detaining the regional Majlis leaders for corruption cases while the latter were trying to undertake the Ahbashism campaign. Reports from the two regions indicate that despite the instability of the areas, the authorities never tolerated the attack on Islam and Muslims (the authorities themselves are Muslims who share the feeling of the wider public in many ways if not all in all). They have been resisting the Ahbashism campaign jointly with the Muslim society. And still now, Majlis has no full control over its two unites of Somali and Afar. In the last six months, whenever the Majlis and its adherents try to take possessions of mosques and madrasa and install its Ahbash branded people in those institutions, the local Muslim communities haven’t allowed them. Reports show that the Majlis adherents couldn’t take the leadership of any mosque and madrasa except those they had before the new Ahbashism campaign. However, this had never happened without a cost. Many imams, scholars, preachers and community leaders have been detained. Some of them are still imprisoned at different places. 1. The Demonstrations held in Washington DC in November: It was a very successful though the number of participants was small. 2. The Demonstrations of Aweliya Student: When the Majlis had deposed the teachers and students of Aweliya Islamic Institution, the students were very angry. 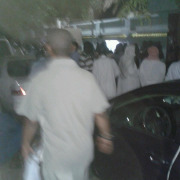 They gathered themselves at once and demanded the Majlis to allow their teachers and spiritual leaders back. They demonstrated continuously for about a week. But thereafter, they decided not to leave the compound of the institute unless they got satisfactory solution. 3. The Demonstration of Dessie Muslims: In the afternoon of January 23/2012, the Federal Majlis sent its delegates to take control of the Zonal Majlis offices of Dessie and the “Shewa Ber Madrasa”. Hearing that, the Muslim population gathered at once in the zonal Majlis and shouted against the actions of the delegates. They clearly stated that they won’t allow an imposition of any new ideology or unelected leadership on their faith. On the next day, they gathered in large mass at the zonal Majlis office and then, marched for a big demonstration in the streets of the city against the Ahbashism campaign. Seeing this, the zonal government authorities requested the Majlis delegates to lift up their demands and return to where they came from. The strongest of all anti-Ahbashism resistance movement is the peaceful public demonstration being held weekly at Aweliya Islamic Institue . The start of the movement was the small demonstration undertaken by Aweliya students about a month ago. Now, it became a movement where about 100,000 Muslims pray the mandatory Friday Prayer (Salatul Jum’a) together and speak against the Ahbashism campaign in one voice. The participants come from every corner of the city of Addis Ababa. And both genders (males and females) attend it in large masses. The call for the meeting have been done mostly on the aforementioned facebook groups, the cell-phone sms services and social clubs. 1. The petitioning against Majlis and its Ahbashism policy (records show that over 40,000 people have petitioned until now). 2. The establishment of a provisional committee of 16 people that will speak on the behalf of the Muslim public. The committee had taken appointments from different government authorities in the last week. But when it tried to present the demand of the public on Wednesday, February 1/2012 (on the day of the appointment), they Majlis had played a malicious game and delayed the meeting. And it is postponed for 13/ 2012. (It was said that the Majlis leaders came to the meeting place and said “It is wee who can represent the Ethiopian Muslims so that we must be present on the meeting”). As a Muslim, I can’t say many words about the future trends. But I definitely say neither of the collaborators (USA, Ethiopian Government and the Majlis) can meet their demands in any illegal and unconstitutional method. Allah Knows better. Munib Omar Added 7 years ago Masha Allah very brief description!! Mohammed Added 7 years ago It's great article.We can see the developments and challenges from your article.Inshallah,we should struggle to the end.No retreat no backup. Endris Added 7 years ago Jezakilahheir.Continue ur struggle. mohammed Added 7 years ago Jazakellal! Ato Temam Aba Bulgu Tenatawi Tsufachewun aqerebu ' ye haymanot netsanet be Ethiopia Yelem"